CHICAGO – ComingSoon.net went to ShoWest and posted the first image of a teaser poster that you’re likely to see all over theaters for the rest of this year, the first official artwork for the sequel to “Twilight,” “The Twilight Saga’s New Moon”. What do you think of the artwork? Let us know in the comments section below. The Chris Weitz-directed sequel will star Robert Pattinson, Kristen Stewart, Taylor Lautner, Ashley Greene, and Dakota Fanning. “Twilight,” which stars Kristen Stewart, Robert Pattinson, Ashley Greene and Taylor Lautner from director Catherine Hardwicke, has grossed $178 million domestically. This has put the “New Moon” sequel into production immediately and has spawned a series of casting rumors. Other books in the Stephenie Meyer series include “Eclipse” and “Breaking Dawn”. Read our Dakota Fanning story on “The Twilight Saga’s New Moon”. Read our story about DVD release parties for “Twilight”. Win a walk-on part in “The Twilight Saga’s New Moon”. Read our story about the release date of “The Twilight Saga’s Eclipse”. Read about the new name and logo for “The Twilight Saga’s New Moon”. Read about why Catherine Hardwicke left the “Twilight” franchise. Read our story about AnnaLynne McCord auditioning for “New Moon”. Read our story about Dakota Fanning talking about “New Moon”. Read our story about the open casting call for “New Moon”. Read our story about Lucy Hale auditioning for “New Moon”. See our 2009 Summit release slideshow with “New Moon”. Submitted by Holly (not verified) on March 31, 2009 - 1:34pm. Submitted by MoBo (not verified) on March 31, 2009 - 6:19pm. Submitted by Bryana, Las Vegas, NV (not verified) on April 1, 2009 - 12:52am. The blackness of the poster background is superbly appropriate to the blackness and unendurable emptiness experienced by Bella’s loss of Edward in New Moon. The light which seems to radiate from the words New Moon in the foreground is an exciting, hope filled contrast to the blackness, and complements the concept of new moons representing new beginnings. Submitted by Anonymous (not verified) on April 5, 2009 - 12:30am. Submitted by UnintendedChoice (not verified) on April 1, 2009 - 7:28am. Submitted by aspen (not verified) on April 1, 2009 - 12:51pm. Thats it .They should have put in a little more work even in harry potter when things where going worng or he lost someone dear to him they didn’t make the poster all black.they should put more work into the poster. Submitted by Anonymous (not verified) on April 2, 2009 - 1:11am. Submitted by Anonymous (not verified) on April 5, 2009 - 12:27am. 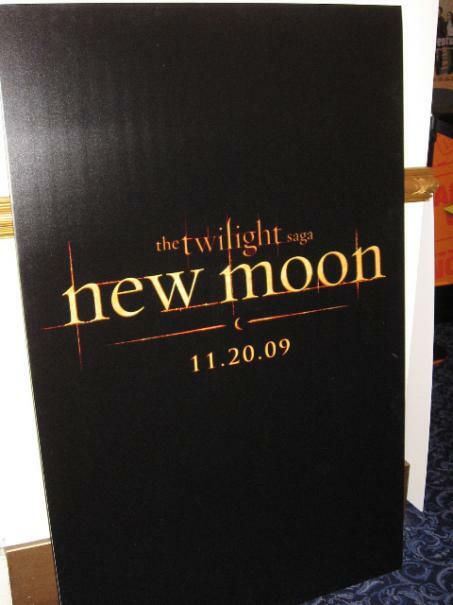 crap dats not THE poster it’ just the logo , i so agree… funny pips kept saying about the blackness being new moon - DUH! its just d color of the poster. People are like ignorant here! Submitted by MoBo (not verified) on April 1, 2009 - 8:20pm. Submitted by Anonymous (not verified) on April 2, 2009 - 1:08am.